As many Reg readers will know, between the start and end of a project there’s often an awful lot of coffee. However you make it, a coffee is essential for many of us. It’s become such a part of our life – in many places supplanting the good old cuppa – that there’s a huge industry of coffee shops, roaster, machine makers and so on. 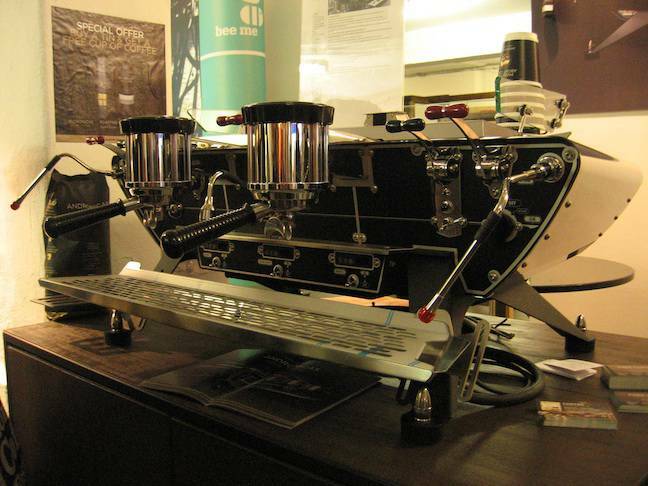 All of those are on show at the London Coffee Festival, in Shoreditch’s Old Truman Brewery this weekend. I went along on the "trade" day, where there were plenty of incredible machines focussed on those who want to run their own coffee shop, but there’s also a lot there for the consumer too, and some special offers as well. You’ll find brands like DeLonghi with machines on show, as well as Sage by Heston, and many less well known brands, too. If you’re a Nespresso user, it’s worth checking out the Cafepod stand which is offering compatible pods for £2.50 a pack. Aerolatte, makers of the battery powered milk frother are there too, and you can learn how to use one properly, as well as taking advantage of some show offers. Hario, makers of glass coffeeware, also has a stand where you can see their vacuum pot and cold brewing jugs, with special show prices available too, as does Joco, makers of rather nice looking glass coffee cups. Perhaps the most fun gadget I saw, though, was not electric at all. 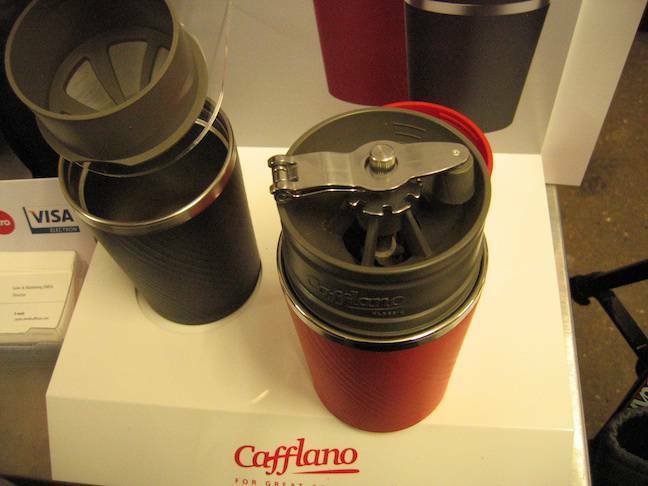 Called the Cafflano it looks at first glance like not much more than a flask. Open the lid, however, and you’ll find a hand grinder, and metal filter. The top of is designed to let you pour hot water over the grounds, and the bottom can be used as a mug. If you’ve been put off camping because of the lack of decent coffee, this could be just the thing for you, and it too is on offer at the show. 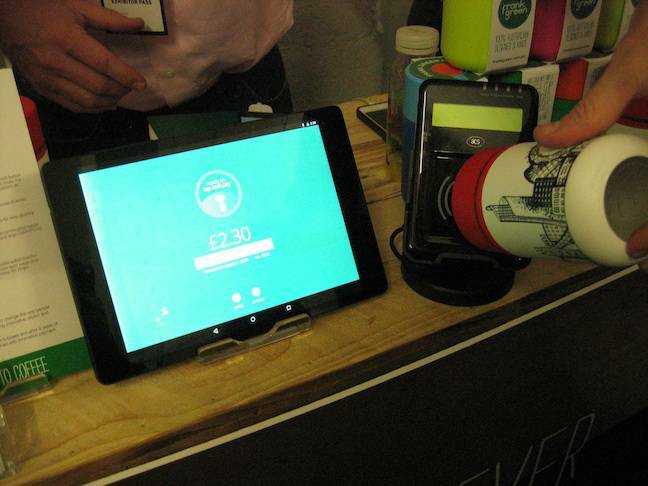 Some companies are keen to make paying for your coffee as easy as they can. 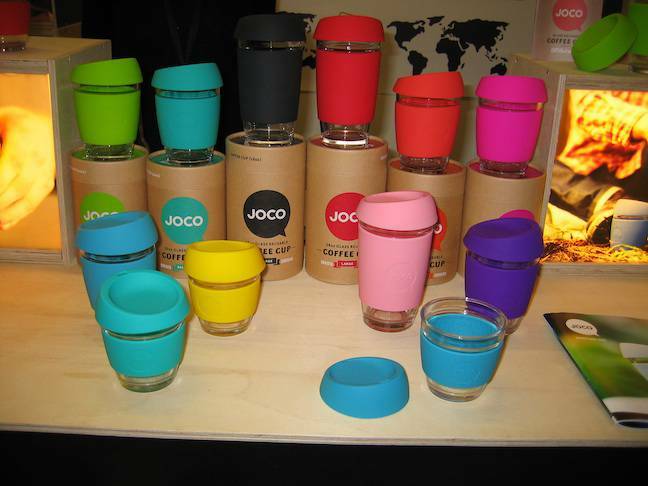 Australian company Frank Green is showing off its re-usable coffee cup, which will set you back £15. Besides looking snazzy, it has NFC built in, so you can pre-pay for coffee using a smartphone app on both iOS and Android. Just your cup against the reader in store. Managing Director Rod Mountford told me that the company’s talking with chains and independent stores about using the system in the UK. A similar idea, though without the cup, was on show from Drip. Only on Apple's iPhone at the moment, an Android version is coming soon, apparently. Their system allows you to pre-pay for a set number of drinks in advance, and on the trade day Drip was hoping to sign up more. Unsurprisingly, the bulk are in east London for now. In a different tech direction, furniture company Evoni has side tables on show that come with built in wireless charging pads. These come from AirCharge, which is also providing charging pads for pubs and other venues, together with a captive, complete with a captive receiver that lets you charge up devices without wireless power. And of course, there’s plenty of coffee to taste, with well known roasters like Union alongside a huge number of smaller firms. But it's not all about a cup o' joe here: there's tea, syrups, and even Baileys, and a bar that serves a splendid espresso Martini for £7. Sorry about the hard-coded passwords, can we sell you some crypto now?